Aiming for the further development of Minato Mirai 21 | Minato Mirai 21 District Heating and Cooling Co., Ltd. The city of Yokohama, an international port city with a rich history and culture, is furnished with district heating and cooling systems designed to support the future development of the city. Work started on the Minato Mirai 21 project in 1983 with the aim of turning Yokohama into an international city of culture that is active 24 hours a day, a city of 21st century information, a city friendly to both people and the environment, surrounded by water, greenery and history. As one of the Core Business Cities in the Tokyo metropolitan area, this is a national project intended to enhance the functional capabilities of the metropolis. 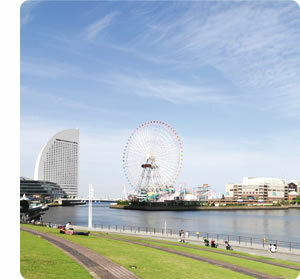 It is a major project that will play a significant role in the development of Yokohama. Within the district, major business, commercial and cultural facilities opened one after another, seeking to make Yokohama a lively and self-sustaining city of international culture. Ever since, the area has been developing steadily as a city of the future. Minato Mirai 21 District Heating and Cooling Co., Ltd., was established in 1986 to play a role in supplying heating and cooling for these advanced urban facilities. Today, we are supplying chilled water and steam to 49 clients night and day. Expectations of district heating and cooling have been increasing in recent years due to the growing need for energy conservation and environmental solutions. In order to respond to these requirements, we are actively deploying new technologies and state-of-the-art equipment. In everything we do, our aim is to contribute to the development of a safer, cleaner, more habitable Minato Mirai 21 District.